Push N Print Cookie Making Set. Create cookies that are a cut above the rest! Use push n print cutters to emboss a message or design before baking. It is a special touch for celebrations and cookie gift baskets! 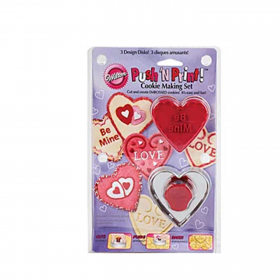 Cutter makes heart cookies approximately 2-3/4" diameter with Love, Be Mine, or linked hearts impressions. Made of steel and plastic. Colors: chrome and red.